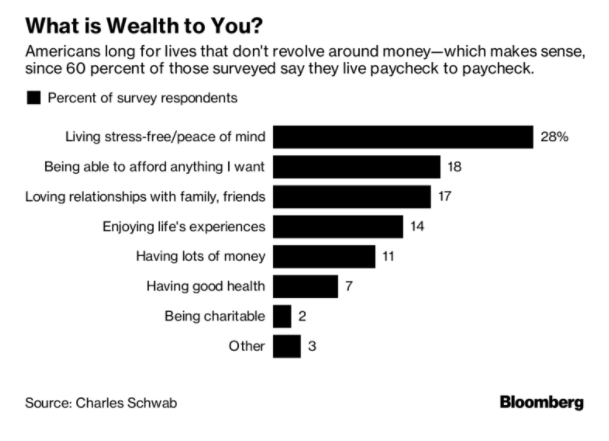 Living stress-free and spending time with loved ones were cited as the definition of wealth for many people in Charles Schwab's annual Modern Wealth Index, an online survey of 1000 people in the US between age 21 and 75. Meanwhile, just 11 per cent of people surveyed said their definition was "having lots of money." But when asked to put a number on what they consider wealthy, respondents said $US1.4 ($1.91) million would make them financially "comfortable," while amassing $US2.4 ($3.28) million would make them "wealthy." There are generational differences to the answers, as Bloomberg reports. Boomers reported $US1.6 ($2.18) million would make them comfortable and $US2.7 ($3.69) million would make them wealthy, while Millennials said just $US1.3 ($1.77) million and $US2 ($2.73) million, respectively. Gen Xers fell between the two cohorts, saying $US1.4 ($1.91) million would make them feel comfortable and $US2.6 ($3.55) million would make them wealthy. And while 18 per cent of respondents said affording anything they desired would make them truly wealthy, 17 per cent said having "loving relationships with family and friends" would do the trick. 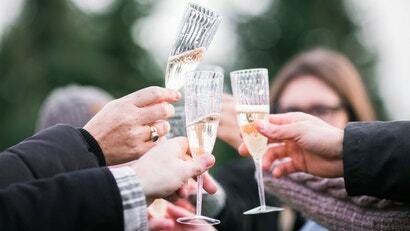 So, what would it take for you to consider yourself wealthy? Loving relationships require you have time to spend with family. For that, you don't just need to be rich - it helps to be SO rich you never actually go to work. Of course, it follows that your kids, having never seen you work, will have no work ethic. So you will need to be rich enough to support them, and probably your grandchildren as well.